A forum post this morning got me thinking about which Lenormand cards might indicate a series of identical events. The discussion centered on the Ring as a possible indicator, since it can show a recurrence, but it doesn’t strike me as an inherently iterative card. I might see it as repetitive in the sense of a “daisy chain,” where each instance duplicates the last, like being on an endless treadmill. The very idea of a “series” implies a progression of some kind, and any line spread in Lenormand that is read as a narrative amounts to a developing series. There are several cards that can mean two of something: the Birds, the Roads/Paths (as in a crossroads offering options), the Whip (which could show a more linear repetition), while the Garden/Park can indicate “many” and the Fish an abundance, although reversion to a prior state isn’t implied in all cases. The Ring with cards that show positive movement (such as the Storks) I have encountered as bringing a situation to fruition, and perhaps as coming full circle, closing the loop on something in a favorable way. With negative cards like the Whip I could see it as being stuck in what the computer geeks who wrote MS-DOS code used to call a “do-loop,” a routine that keeps running over and over with no resolution. 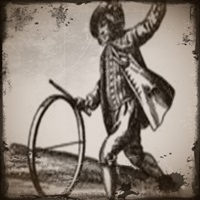 But the Ring alone seems to be too much of an upbeat card to show being stalled or stymied, although successfully “finished” seems to be within its purview. With any card showing “two-ness” as an expression of repetition, the advice would be to remain alert for circumstances that won’t stay settled, and that have a tendency to resurface in some way, whether fortunate or unfortunate. “Two” could be stretched to mean something that just won’t go away, especially with a card like the Tree or the Anchor that shows a long-lasting effect. As always, the surrounding cards would show the nature of that recurrence. The same would be true for any card that reflects a multiplicity, even if redundancy is not implied.